Michael Moore responds to accusations that his film, Bowling for Columbine is filled with inaccuracies and lies. For those who have believed that certain scenes were staged, or certain facts fabricated, Moore responds comprehensively to all the major attacks on the film. He insists the scene where he receives a gun in a bank for opening an account was not staged. He provides a scanned image of the ad in the paper he saw, and responded to, along with an article in the Chicago Sun Times about the offer. The speech Heston made which some have claim has been edited to make him sound rude, Moore provides a link to the complete transcript of Heston’s speech. This entry was posted in Uncategorized on September 25, 2003 by John. On September 11, 2003, the Missouri State Senate overrode a Governor’s veto and enacted a law allowing for carrying of concealed weapons. 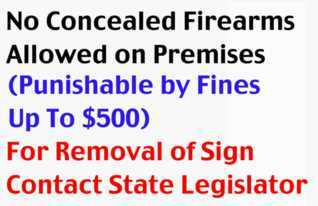 However, the law allows for any owner of private property (including owners of private business enterprises) to post signs on their homes, and business establishments informing people that no concealed firearms are allowed on those premises. If someone enters those premises with a concealed firearm, and refuses to leave, the police can be called and the offenders can be fined. Up to $100 on the first offense. Up to $200 on the second offense. Up to $500 on the third offense. There are restrictions on the size of the sign, and the size of the lettering as well. This entry was posted in Uncategorized on September 14, 2003 by John. The year was 1987. The month was September. I was in Grinnell Iowa, typing away on the Commodore 64 I had brought with me from home. I had managed to convince the staff of the college newspaper, the Grinnell Scarlet and Black, to give me, a freshman, a weekly opinion column. For the second issue of the year, which arrived off the presses September 4, 1987, they printed my first column, which I had worked on all summer long. It was the column I had used to convince them I could write. It compared Oliver North to Dostoyevsky’s character Raskolnikov, from Crime and Punishment, who believed the law didn’t apply to him. An easy comparison. But it was a weekly newspaper, and I didn’t have any other columns already written. So I searched the headlines for news stories, and wrote about the ones that jarred me. This blog entry is about the second column. It appeared the following week. September 11, 1987. Don’t worry, there isn’t anything in the column about New York, the Middle East, or anything truly freaky. I wrote about digital manipulation of photography. 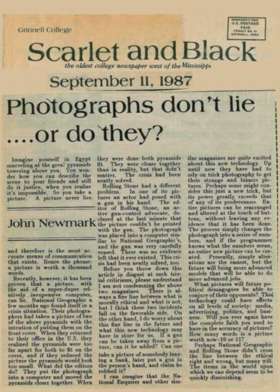 How tabloids had long been able to doctor photographs, but how the process was getting easier. And I wondered aloud how much easier it might get in the future. Remember, I typed this column on my Commodore 64, and printed it out on my dot matrix printer. The internet at that time was a collection of nodes on the Bitnet and Arpanet networks. I became hooked later that year on something called Relay, the precursor to what is known today as IRC. (But that is a completely different story.) The most popular image software at the time was probably PrintShop. Which was used primarily to print banners. Imagine yourself in Egypt marveling at the great pyramids towering above you. You wonder how to describe the scene to your friends and still do it justice, when you realize it is impossible. So you take a picture. A picture never lies and therefore is the most accurate means of communication that exists. Hence the phrase: A picture is worth a thousand words. Recently, however, it has been proven that a picture, with the aid of a super-duper relatively inexpensive computer, can lie. National Geographic a few months ago found itself in a crisis situation. Their photographers had taken a picture of two of the above pyramids with the intention of placing them on their front cover. When they returned to their office in the US they realized the pyramids were too far apart for both to fit on the cover, and if they reduced the picture the pyramids would look too small. What did the editors do? They put the photograph into a computer and moved the pyramids closer together. When they were done both pyramids fit. They were closer together than in reality, but that didn’t matter. The crisis had been neatly solved. Rolling Stone had a different problem. In one of its pictures an actor had posed with a gun in his hand. The editor of Rolling Stone, an active gun-control advocate, declared at the last minute that the picture couldn’t be printed with the gun. The photograph was placed into a computer similar to National Geographic’s and the gun was very carefully erased. There was no evidence left that it ever existed. This crisis had been neatly solved too…. If a gun can be taken away from a picture, can it be added? Can one take a picture of somebody leaving a bank, later put a gun in that person’s hand, and claim he robbed it?…. Entire pictures can be rearranged and altered at the touch of buttons, without leaving any evidence that it has been done. The process simply changes the photograph into a series of numbers, and if the programmer knows what the numbers mean, an entire new picture can be created. Presently, simple alterations are the easiest, but the future will bring more advanced models that will be able to do more advanced jobs…. This entry was posted in Uncategorized on September 7, 2003 by John. (B) accused (C) of killing another individual (D), but since neither (A) nor (C) considered (D) an individual, (B) took the law into his own hands. Somehow (A) killing (B) is justified, as (A) is allowed to kill whoever it chooses. Something neither (B) nor (C) is allowed to do. Now, I (E), agree with (C), but not (A) nor (B). This entry was posted in Uncategorized on September 3, 2003 by John. 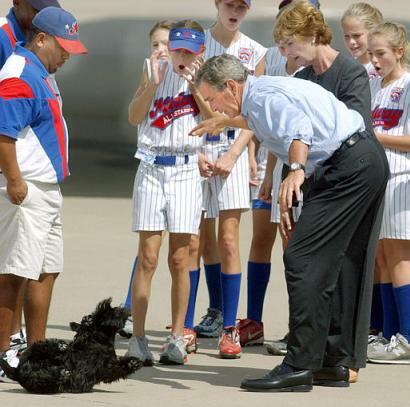 President George Bush decides to show little league baseball players what he learned in high school physics. When you drop an object, it falls towards the ground at an acceleration of 9.8 meters per second squared. This entry was posted in Uncategorized on September 1, 2003 by John.